BERNARDSVILLE, NJ – April 6, 2018 – For any real competitor, there’s the ultimate competition. Think the Final Four. Or the Super Bowl. Or the biggest cucumber at the state fair. For birdwatchers, the not-to-miss event is the annual World Series of Birding, to be held Saturday, May 12. It’s a proud New Jersey exclusive. Individuals and teams fan out across the state for a frenzied 24 hours, trying to spot as many bird species as possible. As it is a key migration time of the year, New Jersey is the focal point for flocking birds that disappear off the Jersey landscape just days or weeks later. If you are a pro, or even a novice, birder, you will do whatever you can over this 24-hour, statewide event to capture that little edge, finding every type of bird possible, while helping raise money for New Jersey Audubon. Birders – which can be a surprisingly competitive bunch – are now implementing the latest technologies. That includes the use of GPS and social media, fueled by smartphones and tablets, as well as WiFi hotspots that can reach into the densest New Jersey forests. “So much has changed in the world of birding in the last 35 years,” said Pete Dunne, a naturalist, author and founder of the World Series of Birding. He has seen it all, scouring the state in the darkest hours of night, listening for the sounds of the rarest birds. Everything from registration, to route planning, to equipment has evolved at the World Series of Birding, he said. Gone are pencils and clipboards. Forget the old paper maps, and asking the guy at the roadside gas station for directions. Birding is clearly a 21st century sport. 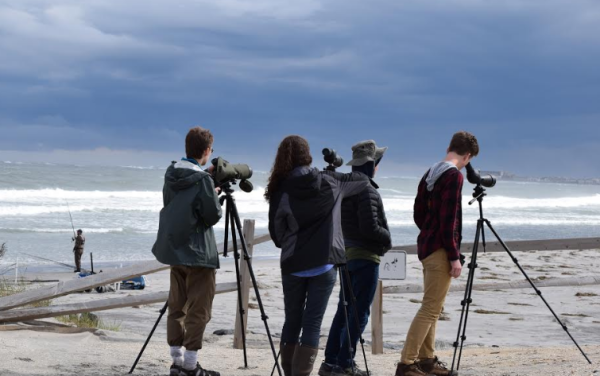 “But the core of the event – gathering, learning and competing with others who love birds and the environment – is still the same,” said Dunne, who serves as New Jersey Audubon’s Birding Ambassador. For the past three years, New Jersey Audubon has produced and invited teams to use an app that has revolutionized not only the way teams keep track of their lists of birds spotted, but also the way in which teams relate to each other during the 24-hour mega-event. On May 12, New Jersey Audubon will fully roll out its new app, and hundreds of participants will be using it. Dr. David La Puma, Director of New Jersey Audubon’s Cape May Bird Observatory, explains the significance. “Using the app, teams record and submit their sightings all day long. If they submit a bird that isn’t supposed to be where they found it, they can send a picture to verify it in real time,” La Puma said. It is also impossible for birders to claim to see, for example, a Dodo bird this year, as a team of experts monitors identifications in real time. If a team claims to see a questionable bird, they are immediately flagged. The app, and social media, has clearly shifted the way teams also strategize for the event, and even how they keep in touch with each other and their supporters. Weather and GPS apps allow teams to change their plans to take advantage of ideal conditions, and avoid deteriorating ones. Not all technology has proven beneficial for these birders. One epic fail? Night vision technology. That’s not exactly helpful for making a visual identification. According to Dunne, the next frontier for the World Series of Birding will be sound amplification and recording. “We’re still trying to figure out what’s legitimate and what’s not,” he said, with a laugh. The rules are running to catch up with the ever-evolving technology.